The Kingdom of Saudi Arabia (KSA) Sunday tossed to the bin the Turkey’s demand for the extradition of two top Saudi officials connected to the killing of Saudi dissent journalist Jamal Khashoggi on Oct. 02 after he entered the Saudi consulate in Istanbul that day for some official papers. Istanbul’s chief prosecutor last week demanded the extradition of of Saud al-Qahtani, a top aide to Crown Prince Mohammed bin Salman, and Gen. Ahmed al-Asiri, who served as deputy head of foreign intelligence. Both men have been sacked from their position and arrested in late October after they were found connected to a team of 15 men who killed the 59-year old journalist after he entered the diplomatic compound. 15-man squad was dispatched from Riyadh. 21 people suspected in know of the killing have been arrested. Turkish officials said the prosecutor’s office had concluded there was “strong suspicion” that the two suspects were among the planners of the killing. 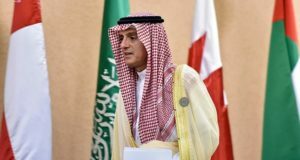 On Sunday the Saudi top diplomat said the kingdom will not hand over al-Qahtani and al-Asiri. “We do not extradite our citizens,” Adel al-Jubeir said when asked about a Turkish court’s arrest order for two Saudi suspects at a news conference at the end of a summit of Gulf Cooperation Council states. “It’s interesting to me that a country that would not provide us with information within a legal format… would issue arrest warrants,” he said. Turkish President President Recep Tayyip Erdoğan has repeatedly called on Saudi Arabia to reveal and handed over to the Turkish justice the 15-man squad and planners of assassination. Turkey finger-pointed the high levels of the Saudi leadership for Khashoggi’s killing but sparred the Saudi monarch, Salman, therefore heaping pressure of the Crown Prince, Mohamed bin Salman. Saudi Arabia repeatedly denied Khashoggi’s death but later confessed under international pressure. Riyadh has also rejected any involvement of the Crown Prince despite US Center of Intelligence Agency CIA telling the US senator that the heir of the Saudi throne ordered the killing. Turkey has shared tapes of assassination with several world powers including the U.S.